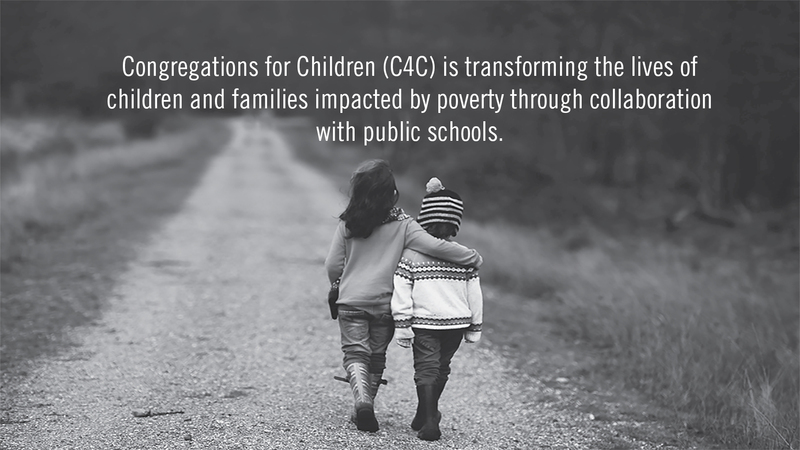 Congregations for Children (C4C) is a resource of the WNCCUMC created to provide support to churches and communities in developing new and strengthening existing church and school partnerships. Each church, school, and community are unique. Therefore, the process should be uniquely developed according to the needs and resources available. C4C provides opportunities for our faith communities to grow in understanding of and in response to child poverty. Poverty seminars and poverty simulations are offered through the Western North Carolina Conference of The United Methodist Church. As we become more aware of the needs and challenges faced by children, families, and public schools, through education and personal experience, we are in a position to respond with a prophetic united voice. The conference is in the process of developing an advocacy team. This is the heart of the ministry. While book drives and home libraries are important a transformational response requires a deeper level of commitment. Literacy is directly related to school success. Studies reveal the importance of reading by the end of third grade on graduation rates and 75% of prison inmates are high school dropouts, and 80% are illiterate. Reading is a critical component to success. Churches are engaged in initiatives during and after school as well as through the summer. These programs include tutoring, mentoring and reading buddies, and summer literacy initiatives. It is hard to work, study, and learn on an empty stomach. Inadequate or unhealthy diets, clothing, shelter, etc., are very real challenges for many children in our communities. Provision of basic needs should be part of the plan, but not central to it. In order to help children and families move beyond poverty, the relationship and education components should be central to the plan, followed by attention to basic needs. Building relationships through family engagement helps to provide support to those who seek a way out of the trap of poverty. As the overall C4C process moves forward, churches should begin to work collectively, seeking solutions that focus on poverty reduction.